It&#x27;s still January, but with our unseasonable cold followed by unseasonable warm weather, the plants are getting a little confused! We love spring blooming bulbs in our garden. Tulips, crocus, alliums, daffodils, narcissus... we love them all! So, I'm always worried when they start coming up a little too early, as the Pacific Northwest winters always have Spring surprises. It almost always works out just fine though; and to have a light at the end of our dark-winter tunnel is always appreciated. 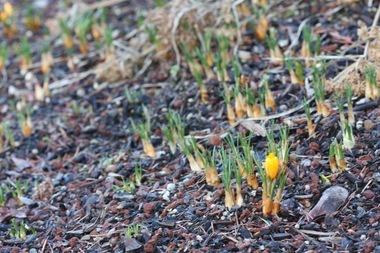 Crocus are typically first on the scene, but this year it seems a month too early! 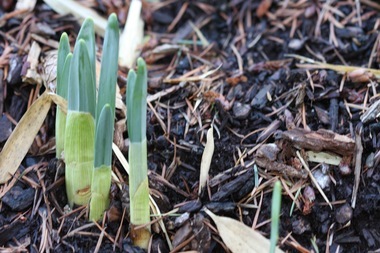 Daffodils are starting to rise from hybernation... Hope we stay nice and mild for the rest of the winter! New shoots are popping up everywhere I look: daffodils, alliums, crocus and even the tulips! 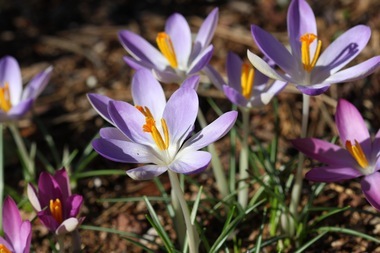 This is a great contribution, because I never thought about bulbs blooming too early due to an unstable season. In December, my husband and I planted a variety of bulbs (almost 600 of them), and many of them are already pushing through the soil. I do not know if this is normal, but I am excited nonetheless. Please keep us posted on the progress of your bulbs&#x27; blooms. Awesome and symbolic gift idea. You've given me a solution to some friends' 40th birthdays. Thank you for sharing! You are welcome, though I can't claim the idea as totally original. I was inspired by Barbara Kingsolver's book - Animal Vegetable Miracle - where her friends gave her plants for her birthday. I hope my friends think about doing this for my 40th!